I love vegetarian food, though I’m not actually a vegetarian. I love the colours, flavours and creativeness of it. We tend to have meatless meals 3-4 days a week and use lentils, beans and pulses a lot. 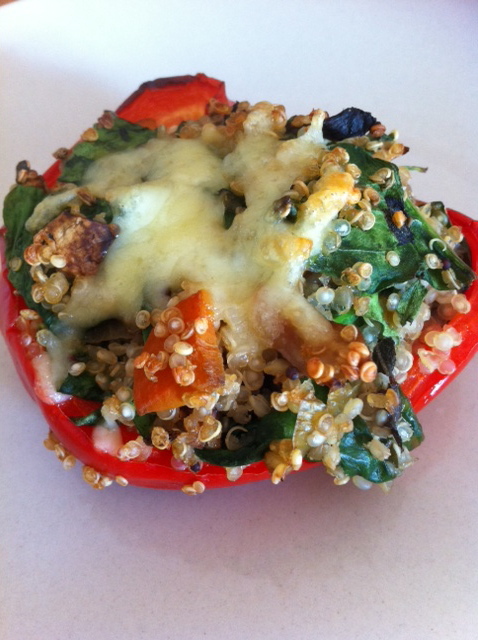 Last week I really fancied having a go with Quinoa, its not something we eat that often but being wheat free I can’t eat cous cous and had had an urge for making stuffed peppers, plus the baby hadn’t given Quinoa a go yet. These came our really well, even if my husband had to take his in a plastic tub back to work to eat as his on-call phone rang! 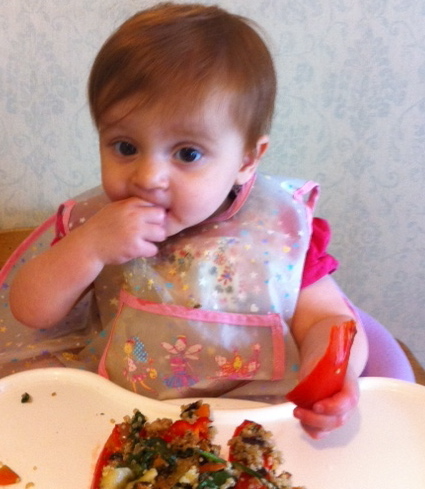 His comments were that it was difficult to eat without a knife but the Quinoa was delicious and nutty. The baby managed to eat hers all without a knife 😉 fingers sufficed and the whole lot went quite quickly, so I’m taking that as a compliment. Remove the stalk and seeds from the pepper and then halve them, roast in the oven for about 30 mins at Gas Mark 5. Saute a mix of veggies (I used mushrooms and courgettes), cook the Quinoa using stock and then add to the veggies with a little stock and plenty of fresh herbs. Stuff it all in the pepper and top with grated cheese, bake until the cheese bubbles (Use Cheezly if you are dairy free as it melts best). Yum yum. Due to the fact I have Crohn’s disease I’m on a wheat free diet. I’m not allergic to wheat, but definitely intolerant to it and I know quite soon after eating something that contains wheat. Wheat free food and all specialist food can be quite expensive so my way around that is to shop around and to make as much of my own wheat free food as possible. This means my cupboards are full of weird and wonderful things like Xanthum gum (one of my fav things, it has made my bread so much better) and many flours. I typically like to use rice flour, rye flour, potato flour, chickpea flour, cornmeal, cornflour and tapioca flour. Buying all these flours can certainly add up, but there are a few tips and tricks I can pass on…. Don’t expect these specialist flours to be a good price at your local supermarket, but do keep checking as they sometimes have offers on. Look online at the specialist health food stores, again they often have offers on. Try health food shops and farm shops. One of my farm shops has the most fantastic range of wheat free foods and often has deals on. Ethnic shops can be great. 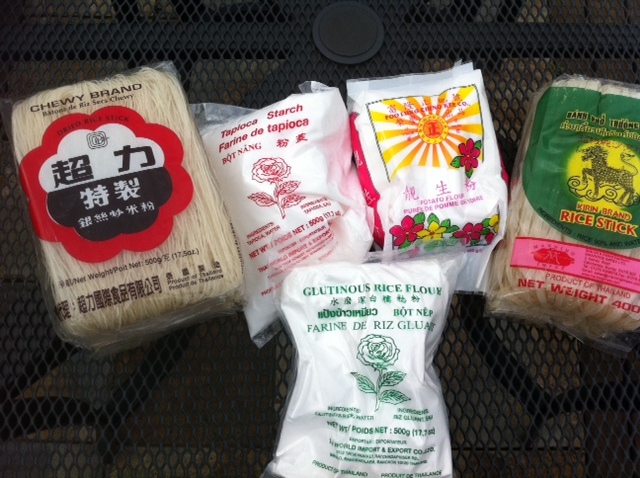 I get my rice flour, tapioca flour and potato flour plus rice noodles from the Chinese shop and my chickpea flour from the Indian shop. Much cheaper than anywhere else. Although the premixed flours you can buy are easy they are not always the best, try mixing your own blends. I find rice flour with cornmeal and rye flour is good for bread. Making your own bread is cheaper and usually better for you as you can control what you put in and add extra bits….I like a selection of seeds in my bread. Most bought bread has a high salt content, when I make mine I put a tiny amount in or none at all. Other wheat free goodies I regularly make are crumpets, pancakes and scones. Yum. I love summer. Firstly because I am so not built to enjoy a cold climate, the first sign of chillier days and the jumpers, fur lined boots and gloves come out. I end up wearing gloves inside and out when it’s properly cold. But I also love summer produce. Especially anything that I can get to grow in my garden. Having had a baby this year I’ve not managed to be as green fingered as I’d like, but we’ve still done quite well with white and red currants, plums coming out of our ears, greengages, carrots, tomatoes, lettuce, spinach, potatoes, kale, onions and courgettes. A post to come on the courgettes as they deserve it, I have a bountiful harvest of them. Last night after a tiring day with a teething baby I set about thinking up a quick, easy, healthy dinner that required minimal thought and energy. Here’s what I came up with…. A fresh frittata using eggs laid that morning by our resident chickens, kale, courgettes and herbs from the garden and all the leftovers I could find in the fridge. 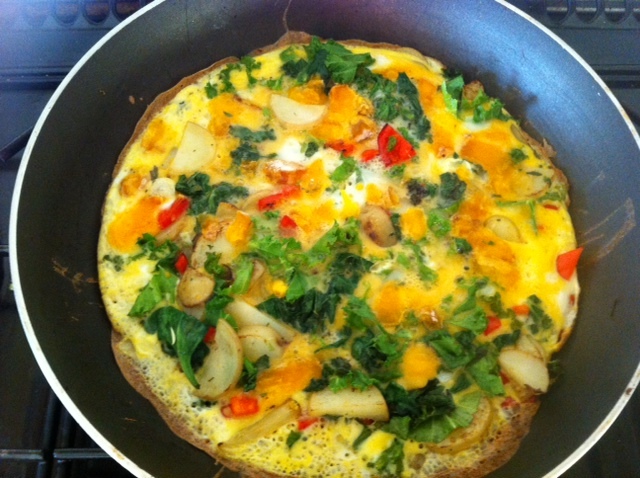 Frittata’s are great for using up leftovers. Served it up with a salad using some home grown lettuce and a quickly made coleslaw. Yum and super healthy.